Mailbox usages need to be regularly monitored and unexpected spikes in mailbox usage need to be investigated further. If mailbox size grows beyond their limit, then data loss will occur, so it's necessary to monitor the mailbox size and their quotas regularly. To generate mailbox size reports administrators need to rely on PowerShell scripts like get-mailboxStatistics, get-mailbox and get-stalemailboxdetailreport. AdminDroid Exchange Online Reporter provides PowerShell free reporting for your Office 365 and Exchange environment. This free tool helps you to monitor mailbox size trends, active-inactive mailbox trends and mailbox quota limits. These reports provide statistics such as allocated mailbox size, current mailbox size, mailbox quota, mailbox percentage used, etc. 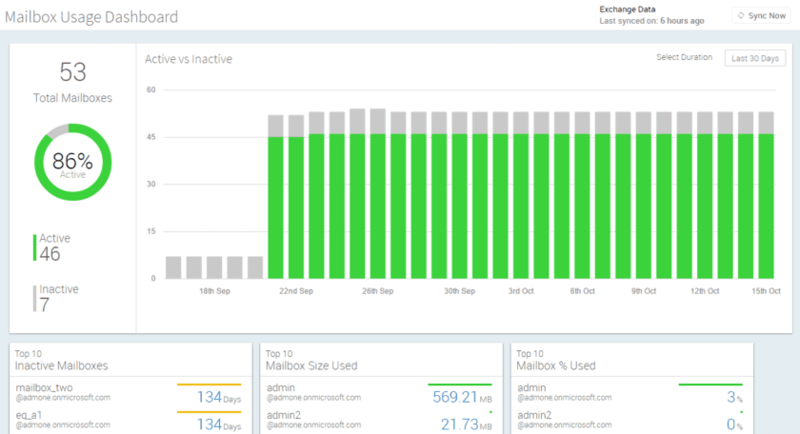 Following are the some of the insights available in mailbox usage dashboard. 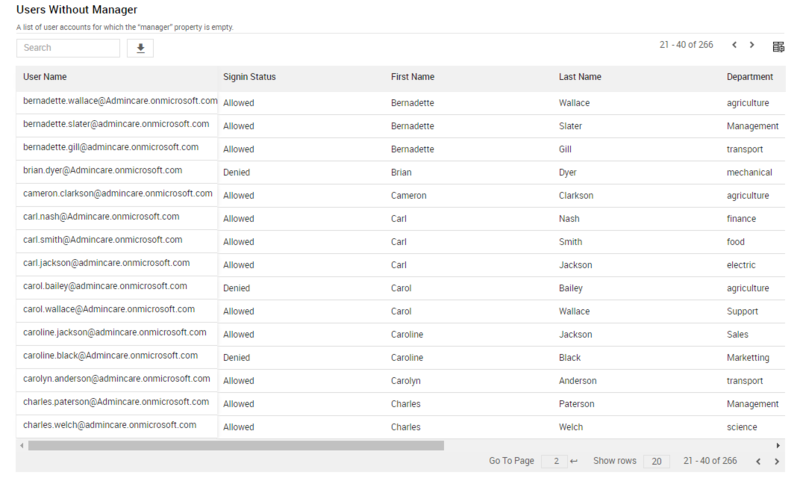 Shows you the currently active and inactive mailboxes in your Office 365 environment. All the active and inactive mailbox trend for up to past 180 days. Shows you the top 10 inactive mailboxes in your environment by the number of inactive days. Following are the Office 365 mailbox usage reports offered by AdminDroid Office 365 Reports. All the reports can be further customized as per your needs. You can schedule one or more reports to run automatically at configured time and delivered straight to your preferred mail-ids. You can export the report results to CSV, Excel (XLS/ XLSX), HTML or PDF. This report gives you the list of all the active Office 365 mailboxes in your Exchange online environment. This report shows you the statistics such as the mailbox size, actual size used, mailbox percentage used, etc. This stale mailboxes report gives you the list of all the inactive office 365 mailboxes which were not logged in for more than 30 days. Inactive days period can be further customized as per your need by using the advanced filter available in the tool. Further this report provides you the info about mailbox never logged in. This report provides you the list of mailboxes crossed their quota limit along with their quota size and current mailbox size. This report helps the administrator to enable the archive mailbox for the users who exceeded their mailbox quota limit. This report provides the daily trend of mailbox size used for each mailbox exists in your Office 365 tenant. This report helps the admins to check for any uncertain spikes in user mailbox size. This report lists all the mailboxes exist in your office 365 environment. It includes all the Office 365 mailbox statistics like mailbox size, mailbox plan, mailbox status, mailbox size used, percent used, etc.